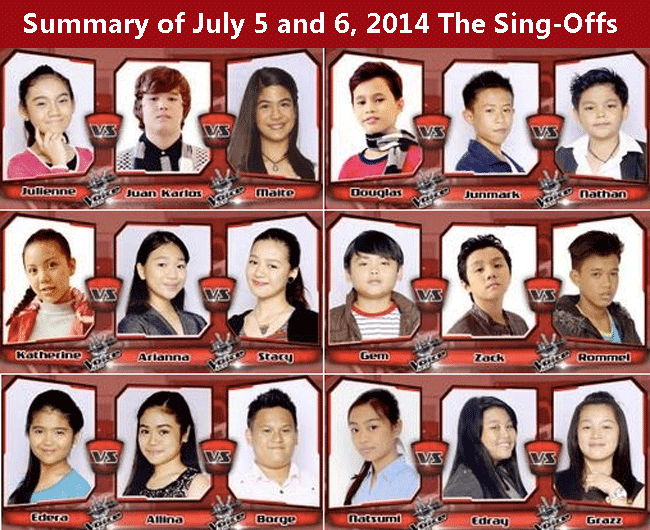 Here are the Results of July 5 and 6, 2014 The Sing-offs for The Voice Kids Philippines with Team Bamboo. Singing competitions will always be a part and parcel of the Filipino culture. And this is The Voice Kids Philippines that depicts how talented the Filipinos are no matter what ages. The Filipino kids are the protagonists this time showcasing their talents from blind audition to convince the judges to include them in their circles and proving themselves worthy to remain all throughout the competition. And this is more than just competition because the kids will be trained well to become a better professional someday. The battle began on Team Bamboo and the 18 young artists will have to do their best in order to survive and advance to the competition. Now the first battle was among Julienne, Karlos and Maite and Karlos became victorious, in the end Bamboo picked Karlos to advance to the sing-off. The second performance on the battle in Team Bamboo was among Stacy, Arianna and Katherine. These were three lovely soul singers who happened to be BFF (best friends). Coach Bamboo, the one who will pick the real winner who will advance to the sing-off appreciated the friendship that they have shown to each other, it was Stacy who prevailed. The third to compete were Edera, Borge and Allina who spent time practicing their piece “The Scientist” from Coldplay. At first, Coach Bamboo said “nobody said it was easy” for the song was really hard to sing. In the end, it was Borge that was picked by Coach Bamboo. The fourth and the last battle for the Saturday edition of the Voice Kids from Team Bamboo was among Nathan, Douglas and Junmark who were regarded as small rockers. The three kids were challenged to sing Aerosmith hit “I Don’t Wanna Miss a Thing” that challenged not only them but also their coach. Coach Bamboo picked Nathan. The battle on Team Bamboo continued as Gem battled against Rommel and Zack. The three had to do their best in order to win the favor of their coach who spent time improving themselves through training, vocalizing and other stuff. In the end it was Gem who made it to the sing-off. The last battle for Team Bamboo was among Edray, Natsumi and Grazz. These three were so close to each other that is why it was hard for them to battle. The three were set to perform “Breakaway” that caused them a lot of challenges. Coach Bamboo still chose Edray to advance to the sing-off. Bookmark and reload this page from time to time to see updates about the Results of July 5 and 6, 2014 The Sing-offs for The Voice Kids Philippines with Team Bamboo.